Eau d'Italie released Au Lac just over a year ago, describing it as a feminine floral with top notes of water lily, bitter orange leaves, and panarea fig leaves; middle notes of osmanthus, rose bud, and sambac jasmine petals; and base notes of cedar wood, papyrus, and mineral amber. I was preoccupied with some non-perfume matters last spring, so I somehow didn't get around to trying Au Lac until recently, although both its notes and its "back story" appealed to me. 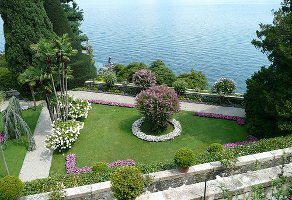 According to Eau d'Italie, this fragrance conveys the impression of "a gorgeous Italian garden at the height of summer, the air filled with the scent of flowers and the fresh waters of a lake" and was "inspired by the love affair between Italian Princess Vittoria Colonna and Futurist artist Umberto Boccioni." There isn't anything particularly Futurist about Au Lac — what would a Futurist fragrance smell like? I'm imagining a mix of scorched rubber, hot metal, marble dust, and red wine — but the idea of a rendezvous in a sunny garden is definitely there. Au Lac opens with a lemon-tinged note of water lily petals. There's also something lightly salty and bright in the initial phases of this fragrance, perhaps some unlisted neroli. The creamy lily petal note never really disappears, but it's joined by a slightly warmer second phase of closely-knit floral notes. I caught a hint of osmanthus, which always reminds me of peach skin, but the jasmine is very subtle and not at all indolic. Au Lac's garden-in-bloom development gains some structure from a greenish wood note (the papyrus?) and a light cedary base. Overall, Au Lac strikes a nice balance between clean and lush notes. I wouldn't have minded just a touch more dirt in this cultivated landscape, but as it is, it's a very appealing scent. While I was sampling Au Lac over the course of the past week, it kept reminding me in some indirect way of something else I'd tried recently. I tried and tried to remember, and then it dawned on me: this scent is what I expected Issey Miyake L'Eau d'Issey Florale to be: a versatile, fresh floral with sheer woody notes. It was only when I did some quick back-tracking that I realized both fragrances were created by the same perfumer, Alberto Morillas. I don't have any inside knowledge of either fragrance's creation, but now that I've made this connection, I keep thinking of Au Lac as the more elegant predecessor of L'Eau d'Issey Florale, with higher quality ingredients, a tighter construction, and a more smoothly polished surface. Au Lac is a bit of a depature for Eau d'Italie, since the line's previous releases (with the exception of Magnolia Romana) have all been blends of wood, spice, and earth. However, if you're anything like me, and you enjoyed smelling Sienne d'Hiver and the very popular Paestum Rose on paper (and on other people) but didn't end up wearing them yourself, because you're fundamentally a pretty-floral lover and you just can't change your ways, Au Lac may pique your interest. It would fit comfortably into a fragrance wardrobe that already includes Ormonde Jayne's white-and-green florals Osmanthus and Frangipani Abolute, for example. Au Lac happens to have excellent staying power for an Eau de Toilette: I could still catch a distinct breath of scent on my wrist after an eight-hour workday. It feels especially suitable for spring and summer, and would transition nicely (perhaps with a slight touching-up) from daytime to a romantic meeting on a warm evening. 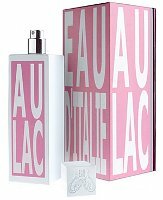 Eau d'Italie Au Lac is available as 100 ml Eau de Toilette ($140). For purchasing information, see the listing for Eau d’Italie under Perfume Houses. Note: image is P1030375.jpg [cropped] by startracker at flickr; some rights reserved. It really is a pretty (but not too flowery/dainty) fragrance — not ground-breaking, perhaps, but well worth trying! I know this is a lame reason to dislike a fragrance I haven’t even tried, but Eau d’Italie lost me as soon as they associated this scent with the Futurists, a movement that had a close connection to Italian fascism. Like I said, it’s a silly reason, but one I just can’t surmount. Ah! Well, I think Boccioni was part of the first/earlier wave of Futurism…and this back-story seems to be more Boccioni-as-lover than Boccioni-than-artist.. if that helps at all. Nancy – I didn’t buy my first Chanel until last year, and for the same reason: the Nazi association during WWII. And I actually kind of feel bad for selling out. Thank you, Jessica! I got a sample of this recently and will try it soon – I appreciate calibrating my expectations against a thoughtful review! I like the line, but this one disappointed me. It seemed – I don’t know – thin? I’m going to get out my sample again and see if I can smell what you’re smelling. Thanks for the review! Hello, H — it’s certainly sheerer and more delicate than Paestum Rose, Bois d’Ombrie, et al. — but I wasn’t really able to wear any of those earlier wood/spice/earth scents, even though I liked sniffing them, so Au Lac is more up my alley. Mals86, I don’t enjoy wearing fig notes, either, but if there was any fig in this fragrance, it was just the leaves of the plant — no fig-fruitiness whatsoever! Sounds very interesting! I’m a fan of the line because even if I don’t like them all (I own a FB of Paestum Rose) I can appreciate the quality behind every scent. I just tested the new Jardin du poete which started rather nice: Orange mixed with nectarine, fresh rather than sweet, lots of basil and green notes. On the second wearing though I got an acquatic feel which would spoil any perfume for me. I have no idea where that comes from because there are no such notes listed. Kristina, I was able to preview Jardin du Poete, and I liked it very much, and then I must have misplaced my sample vial…! so I’m hoping I’ll have a chance to try it again. Maybe Robin will review it for us! Great review, Jessica, and the notes sound lovely – except the “soft cedar”, which usually means iso e super. That chem. blows up on my skin and overtakes everything else in its path! But it’s definitely worth a try! R, I found the sheer-wood notes to be subtle, not the sharp ones I often smell in fragrances in places like Sephora… hope they’ll be the same for you, if you try this fragrance!